Pseudoscience is insinuating itself into our medical schools across the nation, going by the name "Integrative Medicine." Integrative medicine is just the latest buzzword for a collection of superstitions, myths, and pseudoscience that has gone by various names over the years. First it was Holistic medicine, and once that fell out of favor, it became Alternative medicine, followed soon after by Complementary and Alternative medicine (CAM), and lately Integrative medicine. These names can't disguise the fact that many of the practices lumped together are bad medicine. What disturbs me particularly, as a professor, is that CAM is moving into the medical curriculum at respectable medical schools, including the University of Maryland. Perhaps the best way to reverse this trend is to call attention to it. Academic freedom allows professors to proclaim all sorts of wild ideas, including nonsensical ones, but we don't have to allow them to teach courses with no basis in reality. That same academic freedom, incidentally, allows me to criticize bad science wherever I find it, including my own university. Although each of these has a different history, all of them are, well, nonsense. Let's take a closer look homeopathy, which is perhaps the most ridiculous pseudoscience on the list. Homeopathy is based on two ideas: that "like cures like", and that vanishingly small quantities of medicine are stronger than larger quantities. 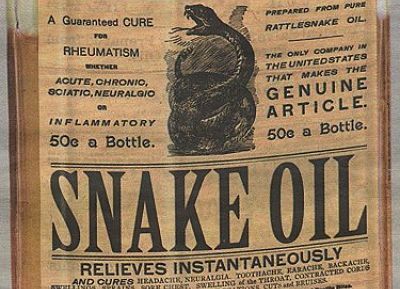 Both ideas were invented by Samuel Hahnemann in the late 1700s, back when most medicine was pretty bad for you. Unfortunately for Hahnemann, his ideas were no better. The idea that "like cures like" is used to justify treating (for example) itchiness with extract of poison ivy. I'm not making this up: this is a standard homeopathic preparation, promoted on many homeopathic sites, even (sorry, cycling fans) on Lance Armstrong's Livestrong website. The second idea is that you dilute these substances so much that instead of causing the symptom, they cure it. Alas, Hahnemann was unaware that when you dilute a substance to the degree that he recommended, you end up with nothing left. Typical dilutions used today go by the abbreviations 10C, 20C, or 30C. One "C" is a dilution of 1 in 100, and 20C means that you dilute the active ingredient 100-fold, and then repeat the process 20 times over. This is a dilution of 100 to the 20th power, a ridiculously large number. If you had a single molecule immersed on a sphere of water the size of the entire planet, it would still not be dilute enough. "sickness, pain or physical disorders are the result of qi blockage, or unbalanced qi in the body. Qigong practice helps to balance the qi system in the body and break the qi blockage(s) to recover health." There's no scientific basis for qi - it is simply magical thinking. The brochure, though, claims that Qigong will give you "an increased resistance to illness through a stronger immune system." None of these claims have any good science to back them up. But it gets worse. The Center for Integrative Medicine is offering lectures and courses in all four years of the medical school curriculum, and it boasts that the "integrative medicine elective has become a top choice for fourth year medical students." How unfortunate that this pseudoscience has infiltrated its way into the medical curriculum, and that the UMM Center is, in essence, mis-training medical students at one of the nation's oldest medical schools. By providing a respectable home for these pseudoscientific practices, UM Medicine is undermining its own scientific and educational missions. But when the money is coming in, the administration seems quite happy to support it. Last August, the Dean of Medicine issued a glowing press release about the Center, after its Director published a very poor study (see my earlier blog about that one) arguing for the use of acupuncture. I don't know if the Dean believed that press release, but someone ought to tell him that Integrative Medicine has no place in a 21st century medical curriculum. I guess I just told him. Note: why do I pick on U. Maryland? Primarily because it's my own institution (although I noted previously that UM Medicine is a separate campus from the main campus at College Park where I work). There are plenty of other Integrative Medicine programs at reputable medical schools, most of them just as deserving of criticism. Why dont you invite Brian Berman on your blog for a one to one interview, it would be good to hear both sides of the story. Homeopathy is such an easy target though. Here is an article written by Dr. Berman (also at U of Maryland) about acupuncture (which you list and call "nonsense") for lower back pain: http://www.nejm.org/doi/full/10.1056/NEJMct0806114. In one big study, real acupuncture appears to be no better than sham acupuncture (both ~45% response rate), but those both are significantly better than conventional therapy (~27% response rate). Meta analysis agrees. And there has been some analgesic effects of acupuncture-like stimulation in animals. More results at cochrane reviews: http://www.thecochranelibrary.com/details/collection/691705/Acupuncture-ancient-tradition-meets-modern-science.html. E.g., acupuncture is no better than sham in treating chronic asthma, although there's no comparison to "no treatment". Browsing 5 or so of the reviews, it seems like most of them have insufficient data to draw any conclusions. So what's your stance on acupuncture, e.g. for back pain, on what looks like a somewhat trickier issue? Andy, two comments: first, acupuncture is no better than placebo, as you write and as I've pointed out before. Therefore it is simply pseudoscience - you can do anything as long as the patient thinks it will work, and they will report a benefit. And acupuncture carries a real risk of harm: there are documented cases of serious infection from the needles. So there's no excuse in treating a patient with something that has even a little risk of harm, when a harmless treatment (such as sham acupuncture, where the needles don't pierce the skin) works just as well. And how can you justify lying to the patient if you know acupuncture is nonsense? A second comment worth making here; any good scientist strives to make sure that everything that he/she claims - on a website or in publications - is accurate. So the fact that Dr. Berman promotes nonsense like homeopathy and gigong on his Center's website demonstrates that he's not a good scientist. I don't excuse him just because other things on his website might be accurate - any pseudoscience is too much. While I completely agree that there is nothing left (or at least next to nothing) in homeopathic remedies, your unqualified mocking of "The idea that 'like cures like' is used to justify treating (for example) itchiness with extract of poison ivy." seems strange, considering the scientifically proven effects of "like cures like" in immunotherapy (of which I incidentally just read an article today in the SF Chronicle http://www.sfgate.com/cgi-bin/article.cgi?f=/c/a/2011/04/25/MN4J1J4LUF.DTL). 2)smallpox vaccine (or other vaccines): using a small dose of a pathogen that causes a similar or milder form of a disease but yields immunity to the patient. Look at what what cowpox was. 3) Use of small amounts of an allergan to build up tolerance to the allergan. Look at allergy shots therapy. Do you think that these three orthodox treatments look suspicuosly like homeopathy? A metaphorical similarity to homeopathy doesn't provide any basis for supporting homeopathy. You could just as well say this is similar to some practices of witches in medeival Europe (it is). You are neglecting two very critical problems with your analogy: (1) the ingredients used in homeopathy have not been shown to have any medical benefit, in any dose, and (2) the dilutions used by homeopaths produce a solution with ZERO active ingredients. And point (2) is accepted by homeopaths, who claim that water has a "memory" of substances that used to be within it. It's just laughable. Steve, if someone came to you and said, I'm going to treat children who have hyperactivity with a small dose of a drug that can cause hyperactivity in a normal child, would you call that homeopathy or quack medicine? Look at you comment: "the ingredients used in homeopathy have not been shown to have any medical benefit, in any dose"
"Oh no, that remedy has not been shown to have any medical benefit" ? Well, using that reasoning, how do you test any new drug? Ever. Steve, the idea of extract of an allergan being able to lessen an allergic response is not, I believe, a new idea, nor one that regular medicine thinks is quackery. Your poison ivy example in your first post may not be the best evidence for your position. I'm not sure what you guys don't understand here. Do you realize that homeopathic preparations have nothing in them except water? A "small dose" is NOT what homeopaths provide. They take water, drop it on a sugar pill, and sell it to you, making a nice profit. This is in addition to the fact that they don't have any scientific evidence for the original ingredients efficacy. But even if they did, their dilution method removes the ingredients they started with. So you should be asking this: if someone came to you and said, "I'm going to treat children who have hyperactivity with a sugar pill", I'd call that a placebo treatment. If they further claimed that it was real medicine, then yes, I'd call them a quack. I think you may be over generalizing with respect to homeopathy. Am I correct that the extreme dilution idea is not what underpins every homeopathic modality? The previous posts make sense. Treatment of a disease or condition with a very small dose of a substance that can cause a similar or same condition is an accepted modality in allopathic medicine. It may be counter-intuitive and yet it seems to work. Treatment of a condition with an extreme dilution is another idea which may or may not work. Anon: you are not correct. The extreme dilution idea is central to homeopathy and does indeed underlie all its treatments. You are also incorrect in thinking that rigorous tests of homeopathic treatments have not been done. They have been, and homeopathy fails. Good scientists move on when an idea doesn't work - this happens all the time. Pseudoscientists do not, but instead make excuses and call for more studies. What is the basis for your statement for the idea that extreme dilutions underlies ALL its treatments? If that is simply your opinion, go ahead and say so. Isn't that like someone saying radiation therapy underlies all treatment of cancer? Do you think that pseudoscientists make general allegations about the underpinning of sciences that they have not studied? You wrote:I'm not sure what you guys don't understand here. What I am criticizing is not your general criticism of homeopathy. I am aware that in most dilutions, no active ingredient can be present. I am criticizing your mocking of treating like with like (you wrote The idea that "like cures like" is used to justify treating (for example) itchiness with extract of poison ivy. I'm not making this up). Please, just be a bit more scientific, and differentiate between (nowadays) accepted reasoning (treat like with like) and seemingly unreasonable (hideous dilutions). And actually: some dilutions still have active ingredients. For example, the lower homeopathic dilution of belladonna is a prescription drug in Germany, because it actually has "stuff" in there. I just wanna stressed out that we have to use critical thinking about things other people believe like in homeopathy for instance. You can't really say that it works unless you experienced it by yourself. I have known lots of people who tried those kind of stuffs & it didn't work it just added to their dilemma. Well these comments highlight why it is important for scientists to communicate with the public. People clearly don't understand that there is nothing in the pills besides sugar and water. This is NOT just Steven's opinion. From the National Center for Complementary and Alternative Medicine (NCCAM) website: "Most homeopathic remedies are so dilute that no molecules of the healing substance remain; however, in homeopathy, it is believed that the substance has left its imprint or "essence," which stimulates the body to heal itself." Keep up the good work, Steven. I've been studying Chi Gong for a decade and find it to be very effective for stretching and relaxation. It is presented to me as a system for staying flexible and the treatment of strains and pulled muscles. My instructors have not spoken of "chi" or mysticism and this blog entry writes off the entire discipline as pseudoscience. It was somewhat unfair in that, while some make such claims, many others do not.